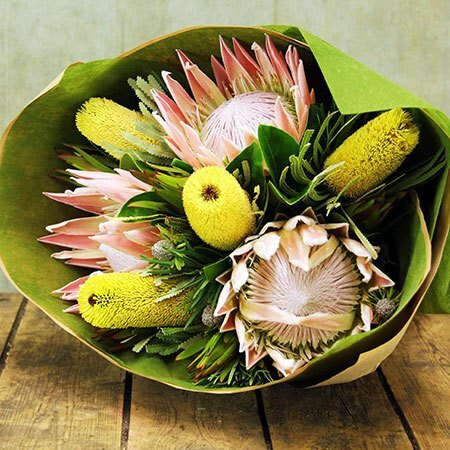 Send a Australiana Xmas native flower bouquet to a friend, relative or client this Christmas! Featuring fresh candlestick banksia and protea in a stunning round native bouquet, this gorgeous Xmas gift captures the essence of Australia and is wonderfully long lasting too! Beautifully presented by our florists in a natural gift wrap and festive Xmas ribbon, you can order these flowers online for delivery up until Xmas Eve or call our florist elves toll free on 1800 66 66 46. PLEASE NOTE: The pictured bouquet design and price is available for delivery in the Sydney, Melbourne & Perth Metro Region only. To deliver in Sydney or Melbourne, please refer to the relevant city under LOCATIONS. For a beautiful native flower bouquet delivered for Xmas outside these locations, please ENQUIRE DIRECTLY on 1800 66 66 46 or email sales@flowersforeveryone.com.au Our fabulous team can provide advice and a CUSTOM QUOTE to place your order via an affiliate florist network.